Kerry's Declan O'Sullivan will be in action against Donegal's Anthony Thompson. THE DRAW HAS been made for the All-Ireland senior football quarter-finals this evening following the completion of today’s fourth round action. Here’s the lowdown on the games as the business end of this year’s championship is set to kick into gear next weekend. Finally after a few weeks in cold storage, Cork have discovered the identity of their next championship opponents. They will face Kildare in a repeat of their 2008 All-Ireland quarter-final, a game where Cork prevailed by 2-11 to 1-11 having had to withstand a late second-half rally by Kildare. Kieran McGeeney’s men will enter the match in a confident mood having strung together three qualifier wins on the trot and having learnt a lot about their capabilities against Limerick last week, they were ruthless in dismantling Sligo tonight. Cork have done what is asked of them this year, maintaining their remarkable consistency in the league as they claimed their third successive Division 1 title in April. They looked good in dispatching Kerry in the Munster semi-final but learnt little from their Munster final victory over Clare. How they will cope from the inactivity since then is a key issue entering this game. 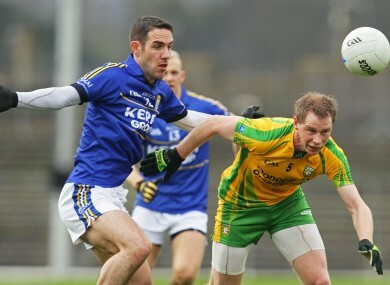 After bettering the Leinster finalists this afternoon, Laois must now prepare to face another provincial foe. The form guides will dictate that both teams defeated Meath by three-point margins in recent weeks yet the truth is that Dublin have been operating at a higher level than Laois recently and it will be a difficult challenge for Justin McNulty’s men. Yet they have gained momentum in recent weeks and the qualifiers has served them well. The fortitude they showed in getting past Monaghan and Leitrim set them up for their best performance of the season against Meath this afternoon. Dublin will be happy with the draw, primarily because they have avoided dangerous opponents in both Kildare and Kerry. The Leinster campaign was a mixed bag of performances but while there is scope for improvement, they have certainly developed a winning habit. Looking further down the line, they must be the favorites now to advance to the All-Ireland final, given the amount of heavyweights on the other side of the draw. Unquestionably the tie of the round. It was the type of game both Jimmy McGuinness and Jack O’Connor would have preferred to avoid at this juncture, yet is the type of fascinating clash that everyone else will be relishing the prospect of. Donegal have enhanced their game this year and improved the attacking element of their game hugely. On the evidence of their Ulster final performance against Down last week, they are now realistic All-Ireland contenders. But an accurate gauge of their standing can be measured by how they fare against a Kerry team who are in a far stronger state than they were a fortnight ago. The qualifier draw against Tyrone energized them and they produced a brilliant performance which was followed by tonight’s blitzing of Clare in the Gaelic Grounds. It’s going to be absorbing to see how this game pans out and particularly what tactics the teams employ to combat each other. You can imagine that both these teams will be pleased at how the draw panned out. Mayo have claimed back to back Connacht titles but now need to kick on. Their defence and midfield look in good shape but there are questions persisting over their attack. The level of quality they have faced in their province must also be factored into the equation given how Leitrim and Sligo both subsequently fared in the qualifiers. They could have been pitted against tougher opposition though but Down will be of the exact same frame of mind and will view this as a game they eminently capable of triumphing in. After the dejection of last week’s Ulster final loss to Donegal, they managed to pick themselves up off the floor to overcome the six-day turnaround and get the better of Tipperary this afternoon. Ambrose Rogers is in terrific form while Benny Coulter’s fitness is also crucially improving. Email “All-Ireland senior football quarter-final draw”. Feedback on “All-Ireland senior football quarter-final draw”.